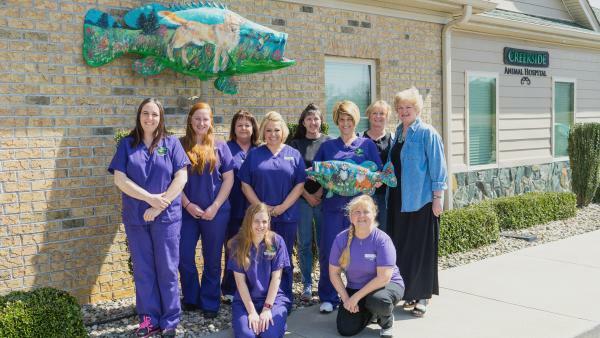 Creekside Animal Hospital opened its doors in late June of 2011, providing veterinary care to small animals, treating everything from dogs and cats to birds, rabbits, and small rodents. We strive to provide the best medical care possible for your pets with the least amount of stress and fear, by building a bonding relationship with our patients and their owners. By treating pets as if they are family, we have instituted preventive patient care that helps us detect diseases early, keeping them as healthy as possible. Creekside offers routine medical care and vaccines, in house laboratory testing, soft tissue surgeries, orthopedic surgeries, ultrasound, radiology, dental care, bathing, grooming, and boarding. We also have a large selection of prescription and non prescription pet foods and grooming products. Photo: kneeling: Dr. Dana Hogg, Holly Jenkins, standing from left to right: Beth King, Meagan Hammack, Lynne West, Shelly Stembridge, Fay Woodruff, Dr. Cindy Elias, Gail Arthur, and from the Visitor's Bureau: not sure her name! Not listed: Jessica Keeter, Kristina Hubbard, Megan Crane, Nicole Powell, Amanda Ezzelle, Ashley Bedgood, and Shane O'Malley.